I bought Outliers two days ago. And though I’m familiar with many of the stories that Gladwell tells I’m still entranced. They work on the printed page and they’ll also work for you in a presentation. How does he do it? Here’s my analysis of Gladwell’s storytelling techniques – illustrated by Chapter Five of the book. Gladwell’s book explores why certain people are exceptionally successful. We hear personal stories and detailed statistics – but Gladwell always starts with a story about one particular person. So Chapter Five is entitled “The Three Lessons of Joe Flom”. Flom is a Jewish lawyer born in the 1930s. We get a detailed trajectory of his career from his humble beginnings to his later successes. He is short and slightly hunched. His head is large, framed by long prominent ears, and his narrow blue eyes are hidden by oversize aviator-style glasses. So as Gladwell tells his story, we can visualise Flom in our minds. His family moved nearly every year when he was growing up because the custom in those days was for landlords to give new tenants a month’s free rent, and without that, his family could not get by. That detail helps us plunge into Joe Flom’s early life – you imagine yourself having to move every year just to get a month’s free rent – that’s emotive and memorable. That’s compelling – Gladwell has given us a mystery and promises to unravel it for us. One story or anecdote doesn’t prove anything. 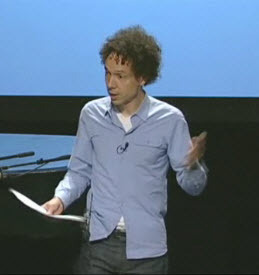 Gladwell muliplies the impact of his first story by delving into the lives of Flom’s cohorts – Alexander Bickel, Mort Janklow, Ted Friedman. Farkas’s Jewish family trees go on for pages, each virtually identical to the one before, until the conclusion becomes inescapable: Jewish doctors and lawyers did not become professionals in spite of their humble origins. They became professionals because of their humble origins. This strategy might be familiar to you from the book Made to Stick by Chip and Dan Heath and from their blog. They call it the Micro-Macro approach. And that’s what Gladwell has done – he’s started with the story of a single person and then gradually zoomed out and shown that hundreds of people share the same story. Gladwell could have stopped there. But he adds a powerful finale to prove his point that success “arises out of a predictable and powerful set of circumstances and opportunities”. He takes a great New York law firm (“generally regarded as the finest in the world”) and one by one goes through the law firm’s founding partners to show that they all share the characteristics that have enabled them to be so successful. This analysis has looked only at Chapter Five of Outliers. But every chapter is constructed in a similar way. Start with an individual story and then zoom out to show how the lessons from the story apply to hundreds or even thousands of others. Every story paints word-pictures, adds detail and dialogue. Gladwell’s storytelling had me turning the pages late into the night. Use the same techniques in your presentation and you’ll have the audience on the edge of their seats. It’s especially helpful because the 7 key points are useful for business/professional presentations but also for everyday networking situations and meetings. Your specific examples (including chapter numbers or other books/blogs when necessary) really helped me understand by giving me more places to check out/read further. I love to improve my ability in story telling particularly in writing stories and articles. This post give me a significant help in achieving that goal. I believe that we should imagine how will our readers or listeners captivate our stories. By knowing that, we can have a nice story telling. What a great analysis, thank you so much!! I haven’t read “Outliers” yet, but I really enjoyed “The Tipping Point” and “Made to Stick”. Apply the Micro-Macro approach seems a very good way to tackle a presentation. It contains one or more stories, creates curiosity and focus in one subject. I’ll take it into account! Yes, I loved the micro-macro approach when I read about it, and it works really well too. Great post. Politicians seem to use the macro-micro approach. They start with whatever big policy point they wish to make and then offer a symbolic zoom-in on an individual. I wonder how this approach stacks up against micro-macro? Has anyone looked at this? For more on the micro-macro approach check out Chip and Dan Heath’s book “Made to Stick”. Interesting analysis and I fully agree…I am a big fan of Malcolm Gladwell and I also sincerely believe that he has a capacity to do tangential data analysis. He can look in to data and create a story in the most tangential manner. This is what creative people call as, “connecting the dots” and “association”. His association skills are exemplary and he makes full use of that in books and presentations. Fascinating story and good lesson on storytelling techniques while reminding me that growing up poor was the greatest gift my parents ever gave me.